Along the way, we made a quick stop at Prae Roup. We didn't plan to visit this temple at all, but since it was on the way, we took a few quick photos. While we were walking around, I saw some tiny thumb size frogs on the wet lawn. I quickly caught one, but despite added efforts, I couldn't catch any more of them. My one frog will just had to work its magic later. 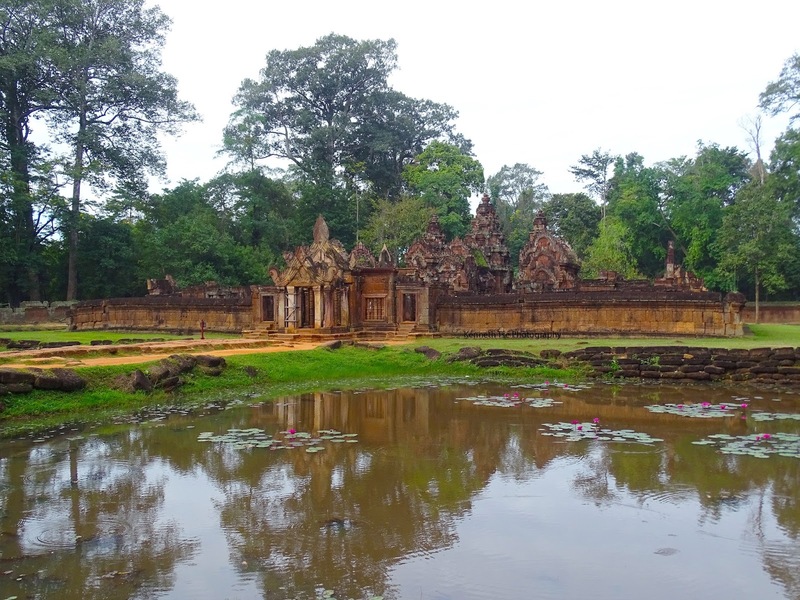 We arrived at Banteay Srei to find just a few cars and a lone tour bus. Great! My sister needed to use the bathroom which was conveniently situated by a swampy area. Peering into the water, I saw many Threespot Gourami. I asked the guards at the gate if it was possible to fish the area and they gave me the OK. So I planned to return later to try to catch these fish. Banteay Srei is a 10th century temple known for its many intricate and well preserved carvings. It is the only major temple not built by the Khmer monarchy and its size is relative small. The French archeologist who discovered the temple tried to sell off four devastas but was caught, thus ensuring the protection of this temple from any further losses. 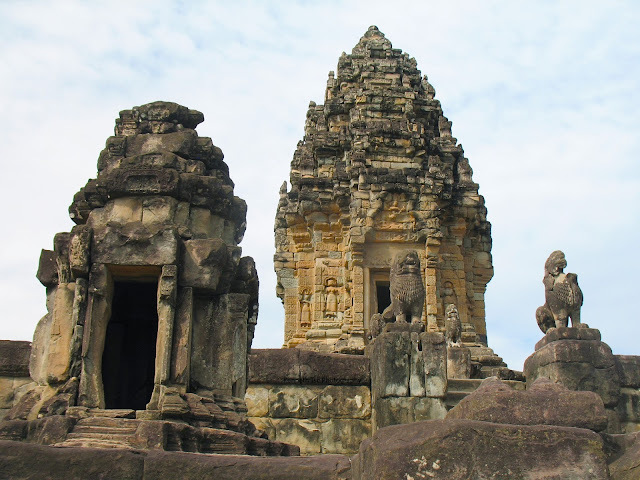 The temple had three main towers. 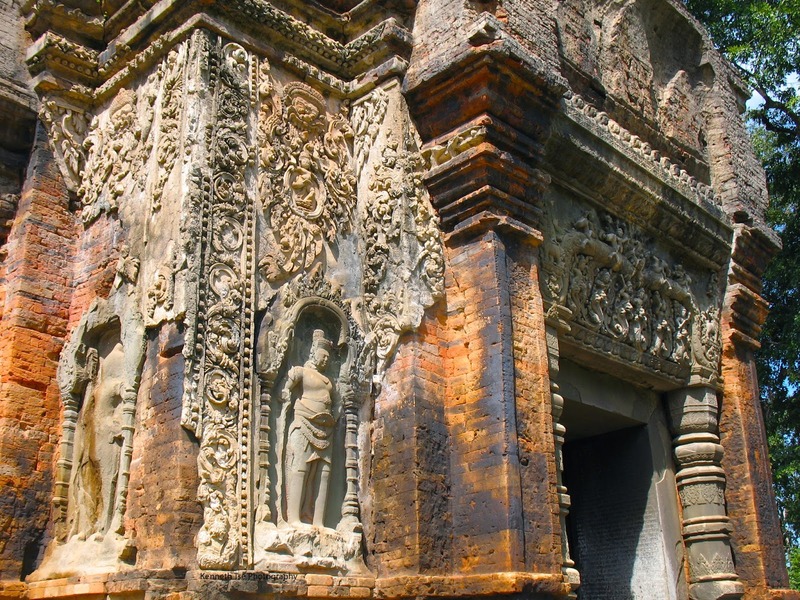 Every exposed surfaces of the towers were meticulously decorated with Hindu themes. The hard sandstone used in its construction helped to preserve the carving to this day. Looking through the doorway of the mandapa. After an hour, the bus tour crowded began to arrive. My sister and I beat a quick retreat and we headed to our next destination, Kbal Spean at Phnom Koluen National Park. It took another 40min of driving in a northeast direction until we reached the park. To reach the Kbal Spean, we must hike 1.5km in the beautiful forest of Phnom Koluen Mountain. 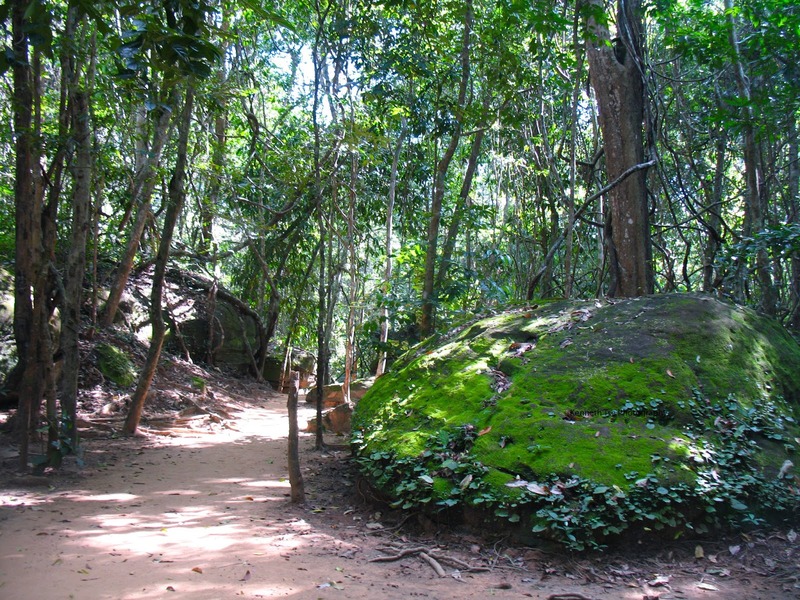 There were a number of wildlife that could be found in the National Park including birds, reptiles and some small mammals. We didn't have to worry about large mammals like Asian Elephant or Tiger as they were not found in the park according to the sign. 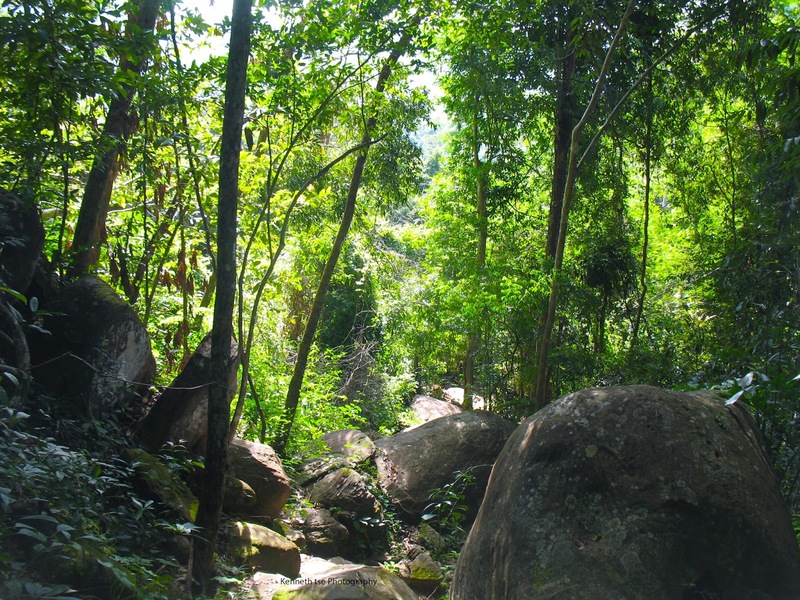 We saw a few bird species, some beautiful butterflies and a few lizards, all of which were too quick to photograph. The trail was not necessarily smooth. One section required us to hike up a rocky gully. It wasn't an issue at all for my sister and I, but I wonder how some of the older visitors managed. Perhaps their tour guide knows another route. Along the way, we saw a large rock perched on a pedestal. 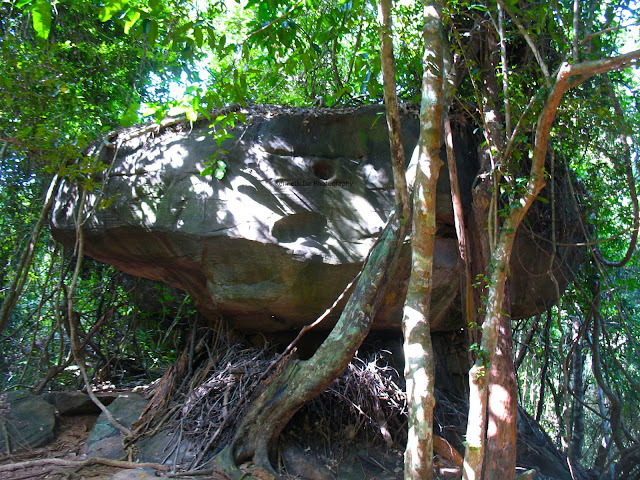 It may look precarious, but looks can be deceiving as the rock was well anchored by roots. Some of these roots actually penetrated through the rock! The trails were much more manicured closer to the ultimate attraction. 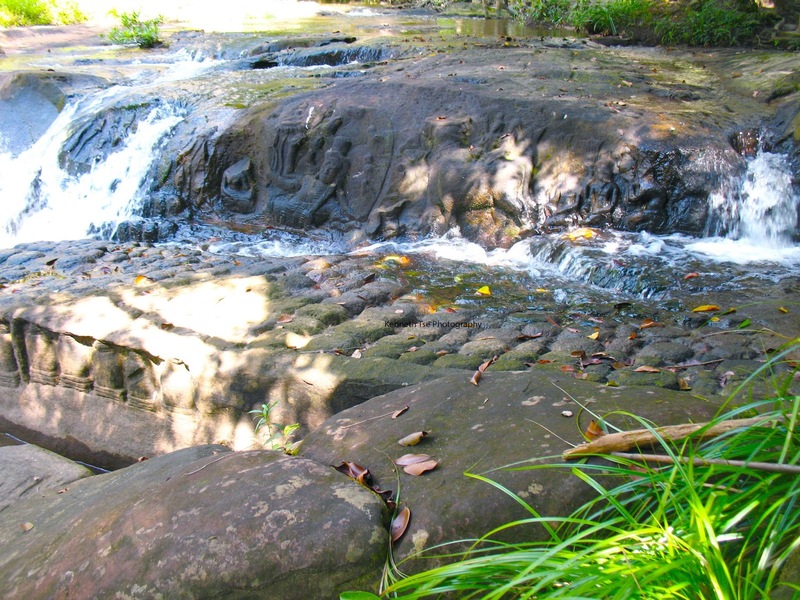 Kbal Spean, otherwise known as The River of a Thousand Lingas, is an Angkorian site. 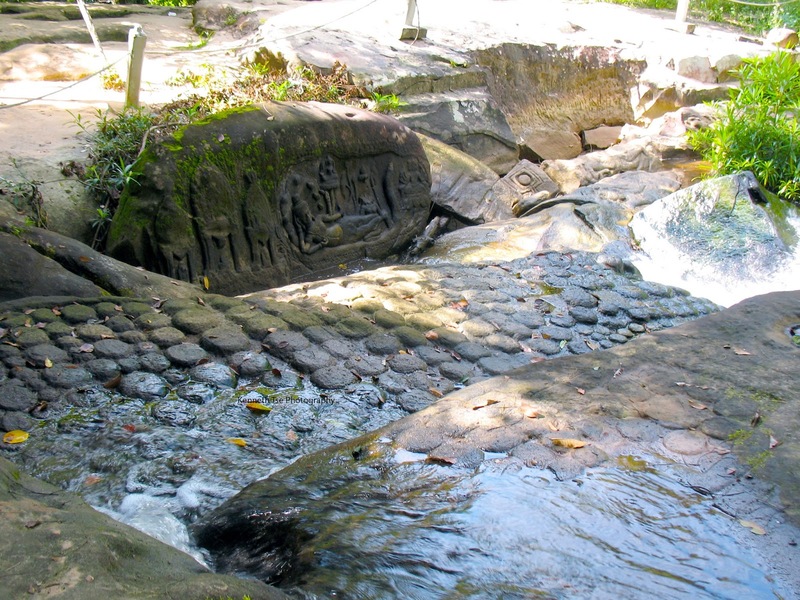 It is believed that the phallic-looking lingas were carved into the bed of this tributary of the Siem Reap River would bless the water flowing into the Angkor. 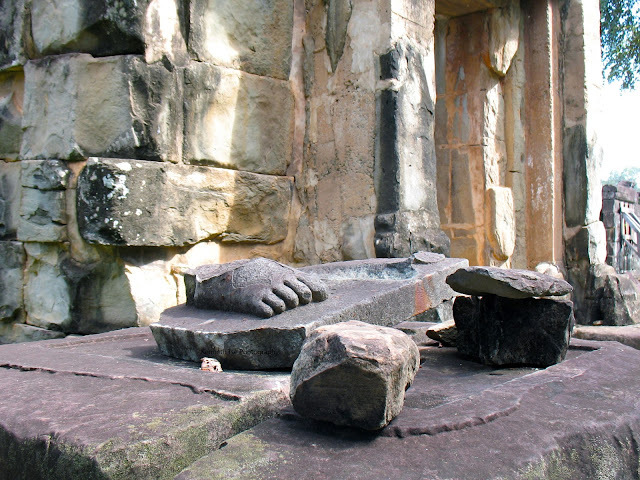 Other Hindu carvings can also be found along the river bank. There were small species of fish that were present. But out of respect, I would not fish at a holy site like this. We did crossed the river at the beginning of the hike and wondered if it was possible to fish there. I guess we would never know. My sister and I thoroughly enjoyed our hike, although the "1000 Lingas" was a bit of an exaggeration. 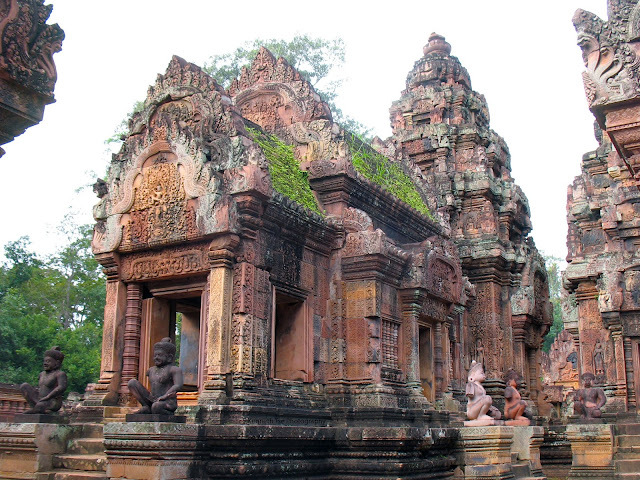 We met Keo again at the car and returned to Banteay Srei for lunch. After lunch, my sister and I split up for an hour. 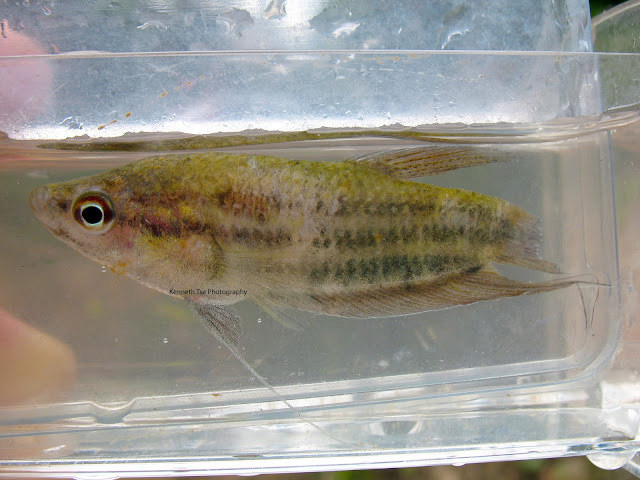 While she shopped for some souvenirs, I spent the time at the aforementioned swampy area to try for Threespot Gourami. 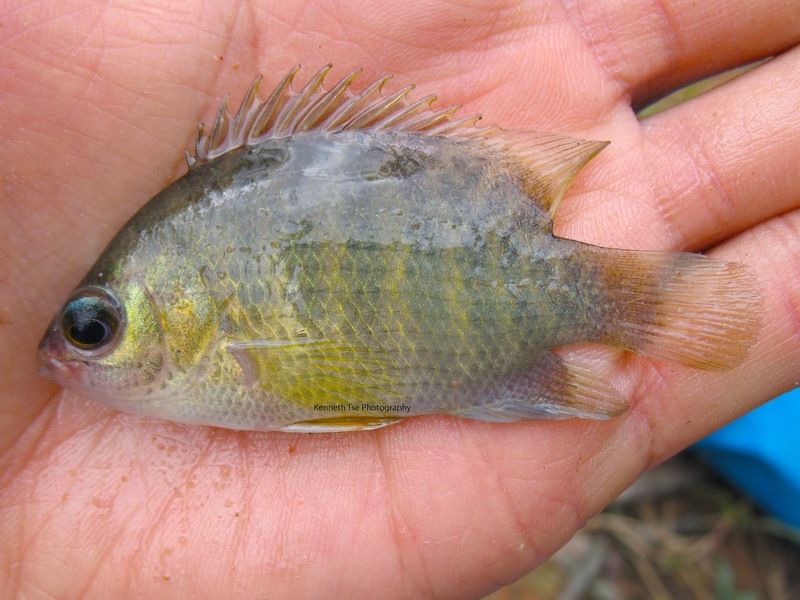 Despite the sheer number of these Gourami, none of them, neither adult or juvenile, wanted to bite. 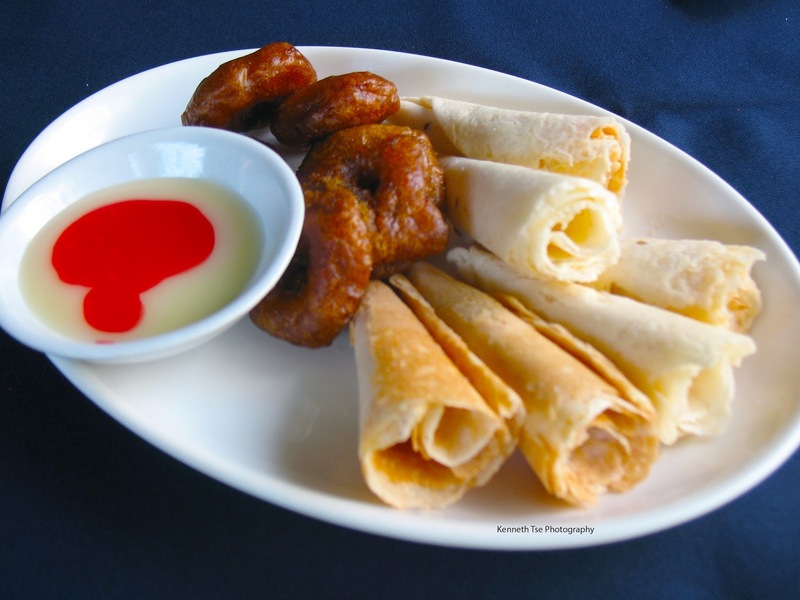 I've tried both bread and flake of worm, and even tried rice at one point. While looking around, I spotted a sneaky little Striped Snakehead hiding under the lily pad. 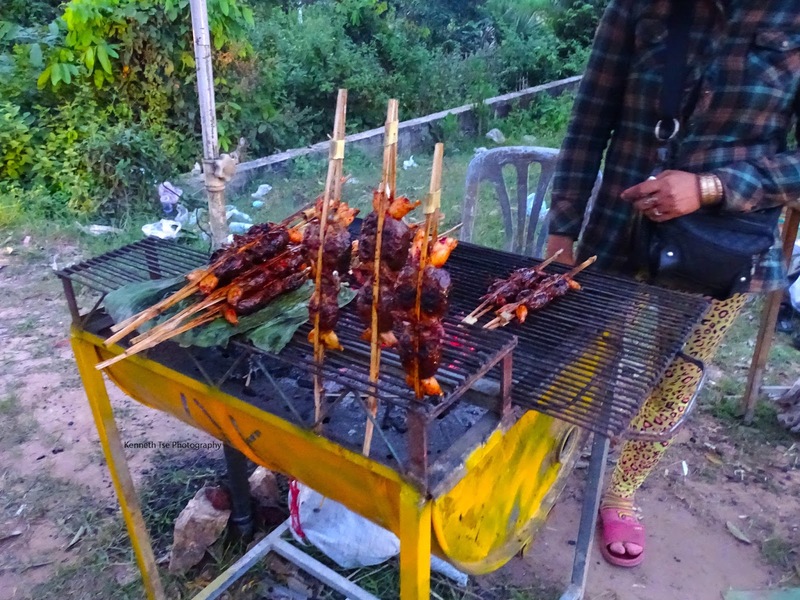 Keo said Striped Snakehead rarely bite during midday, and the other taxi and tuk-tuk drivers were doubtful my short UL rod would be useful to catch the Snakehead. I love proving people wrong. I had been carrying the little frog in my pocket since I caught it this morning. Unfortunately, since the fabric was rather dry, the frog had expired. However, it was still fresh enough to be enticing, and I hooked into onto a #6 octopus hook. I wanted to keep the frog on the surface so the line only had the smallest splitshot pinched on, which made the entire rig a little difficult to cast in the breeze. Still, a few casts later, I was able to adjust to the weight and placed the frog in a likely spot at the edge of the lily patch. As if the fish was expecting the frog, I saw my line twitched only a couple of seconds after the frog had sank a few inches below the surface. The line then quickly veered to the left and I tightened the slack into immediately headshakes. My braided line cut through the weeds effectively despite the valiant effort from the Snakehead to get me buried as deeply as possible. Unfortunately for the fish, even with my UL rod, it was a little small to put up too much of a struggle. To be fair, the Snakehead was about 11" long, so it wasn't completely overpowered by the gear at all. Finally, I caught my top Cambodian target! All the taxi and tuk-tuk drivers finally shut up about the inadequate nature of my fishing gear, and Keo said I was very good at fishing, haha! That's right boys, live and learn! Keo wanted the fish to take home to his family, so I gave it to him. The little frog was lost during the fight, so I tried a small rubber frog for a while and had no other hits. I also did not see any other Snakehead in the area. I tried for Threespot Gourami a little longer and finally ran out of time. 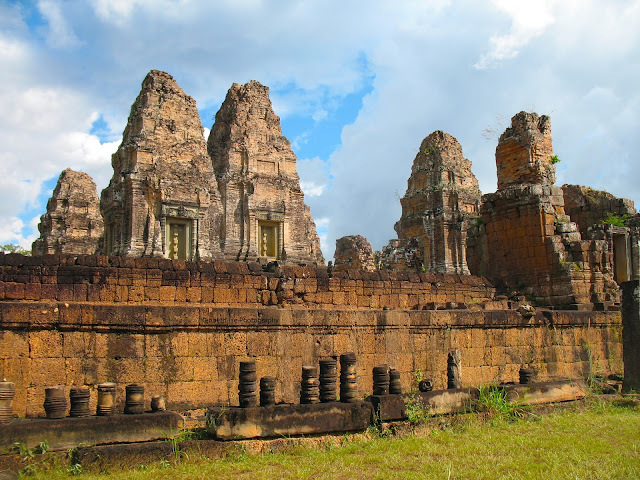 We hopped into the car again and drove south to East Mebon. 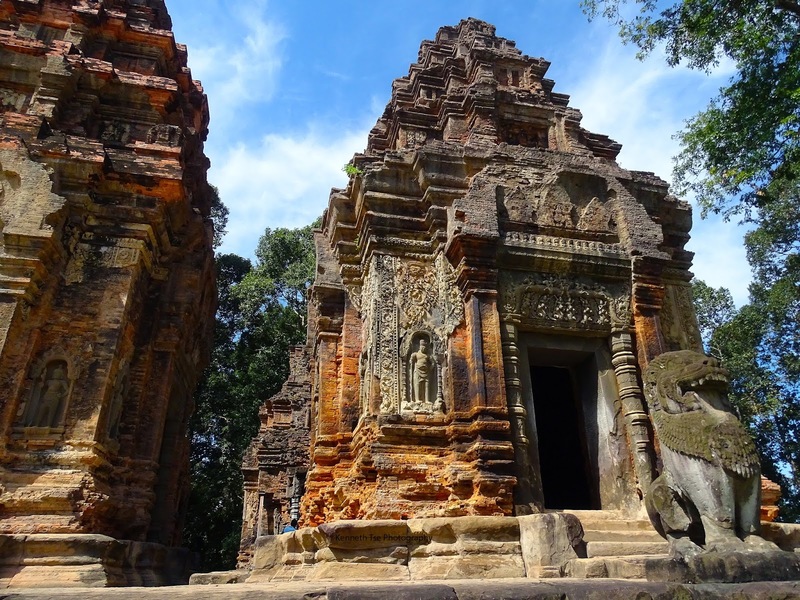 This 10th century temple was constructed on an island in the center of East Baray reservoir. The reservoir had long been dried. The snadtone was brilliantly red in the midday sun and contrasted strikingly against the blue sky. Much of the stucco that decorated the surfaces had been lost, and some of the statues were damaged. Initially, I thought nature had not been kind to the temple as there were many holes on the surfaces of the structure. I thought these were made by insects. Further reading suggested that these holes were in fact man-made. They served as anchoring points for the stucco that decorated the surfaces. 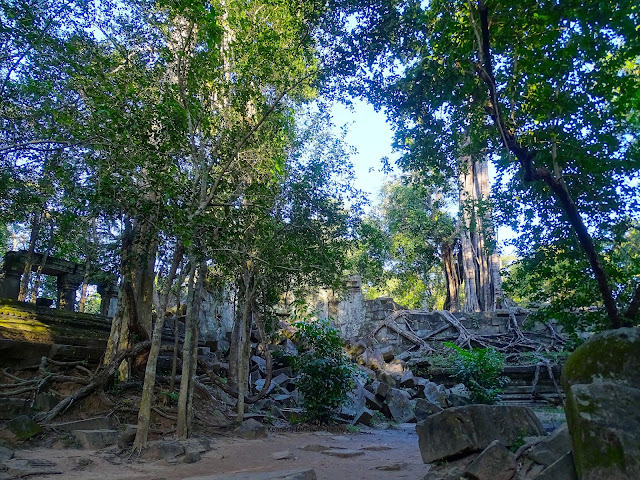 We departed the open atmosphere of East Mebon for the much welcomed shade at Ta Som. 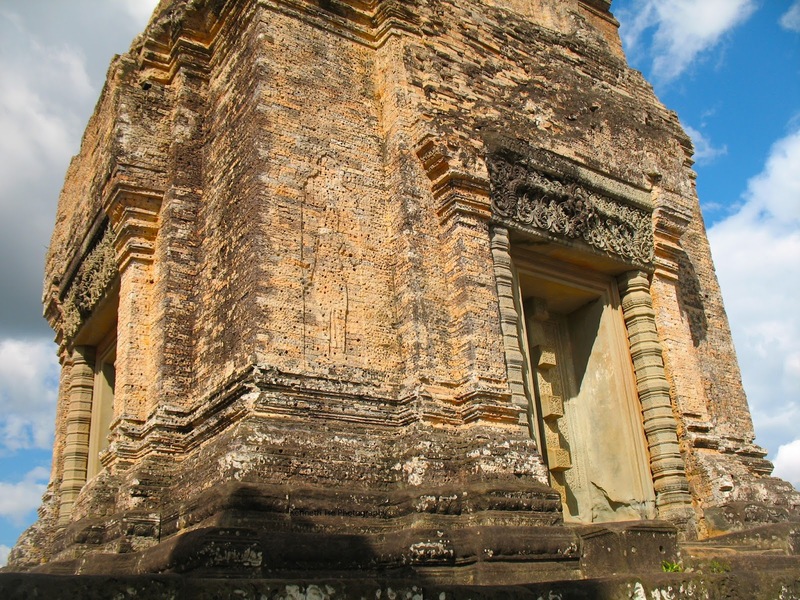 Ta Som is a small 12th century temple. We especially like the cross-shaped gopura that was decorated by four faces. 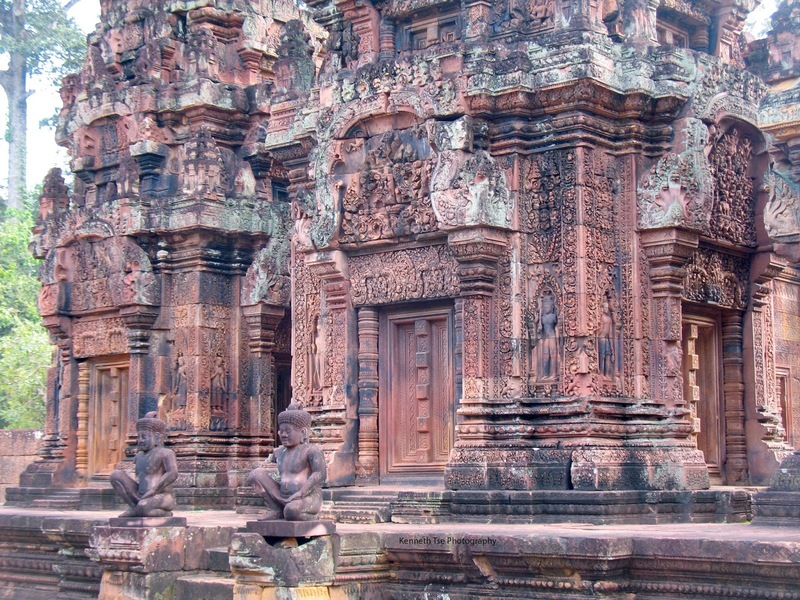 The central structure was enclosed by three laterite walls. 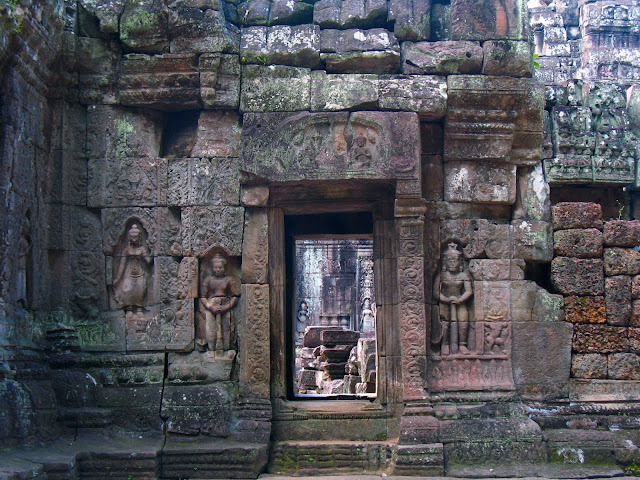 Some of the carvings were preserved. I love this shot peering through the carved doorway into another set of carving behind. 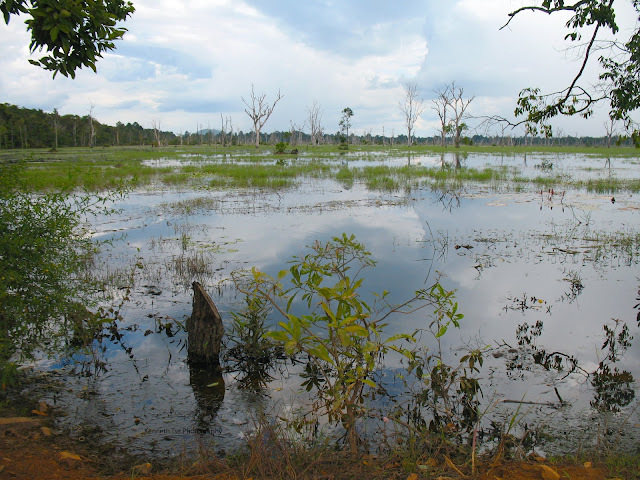 Next, we visited Neak Pean. 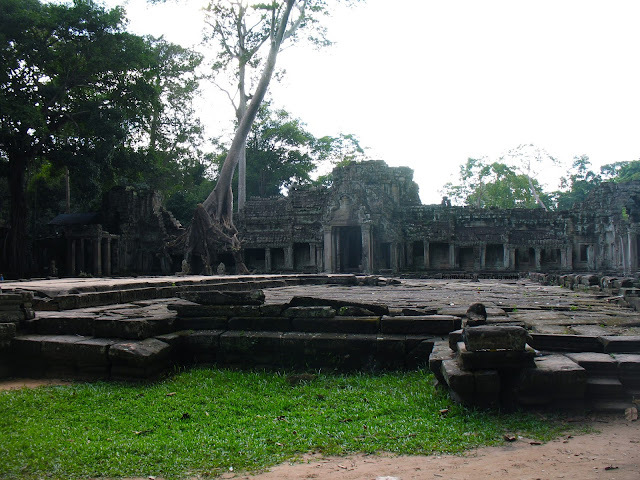 Neak Pean was a Buddhist temple constructed on an island in the Preah Khan Baray. The huge reservoir is a protected swampland now. I saw many species of fish, but unfortunately there were signs to indicate that fishing is not permitted. It was especially cool to see six Striped Snakehead hunting cooperatively in the shallows. I did not know they hunt cooperatively! 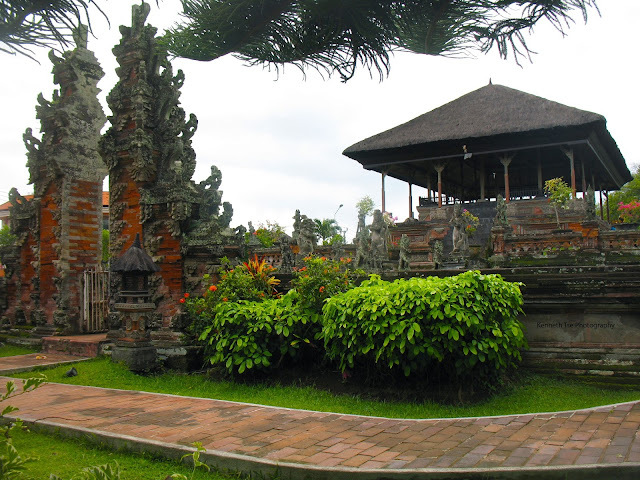 This temple designed for medicinal purposes, as bathing in the pools were thought to balance the elements and cure diseases. 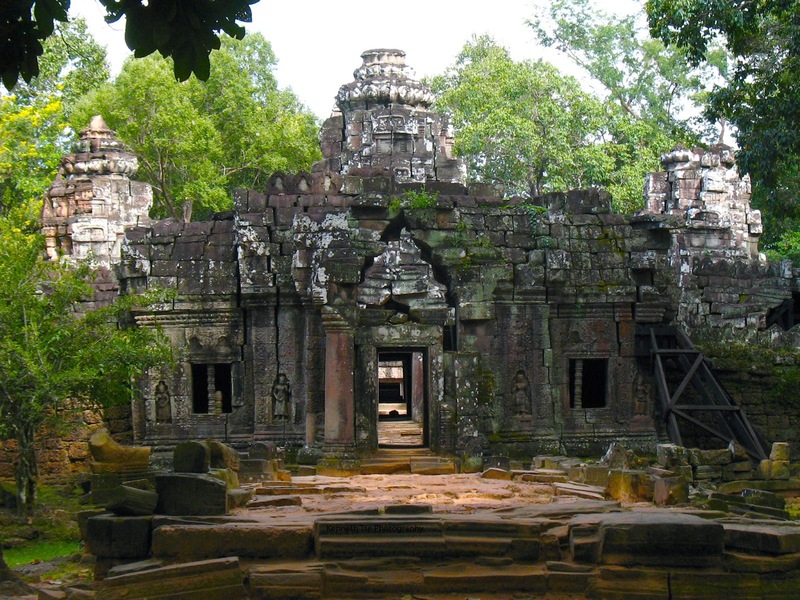 Thus, some believe this temple represented the mythical Himalayan lake Anavatapta. However, on this day, the central pool was stained green by algae bloom. It was rather unappealing. I'm sure once upon a time when this temple was maintained, the water must appear to have magical properties. 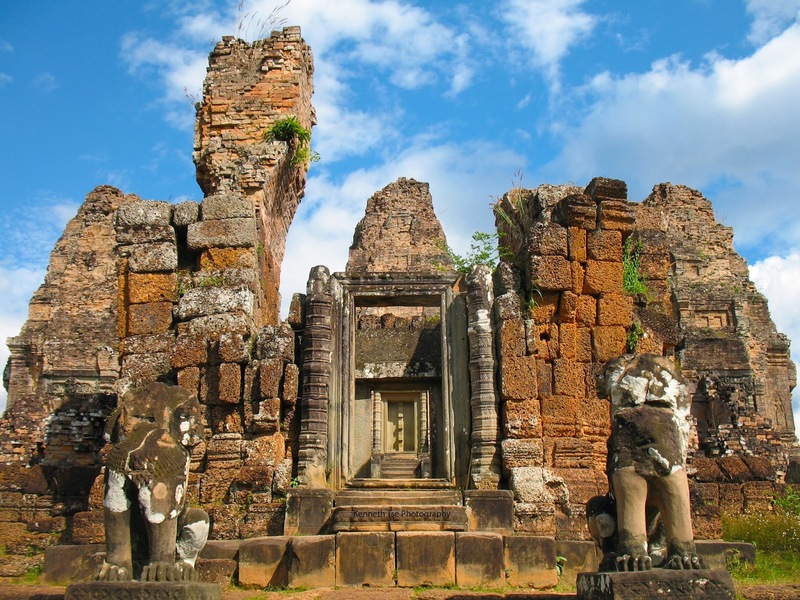 Our last stop of the day was Preah Khan, a large 12th century temple. As opposed to temple mountains, this temple was flat in design. 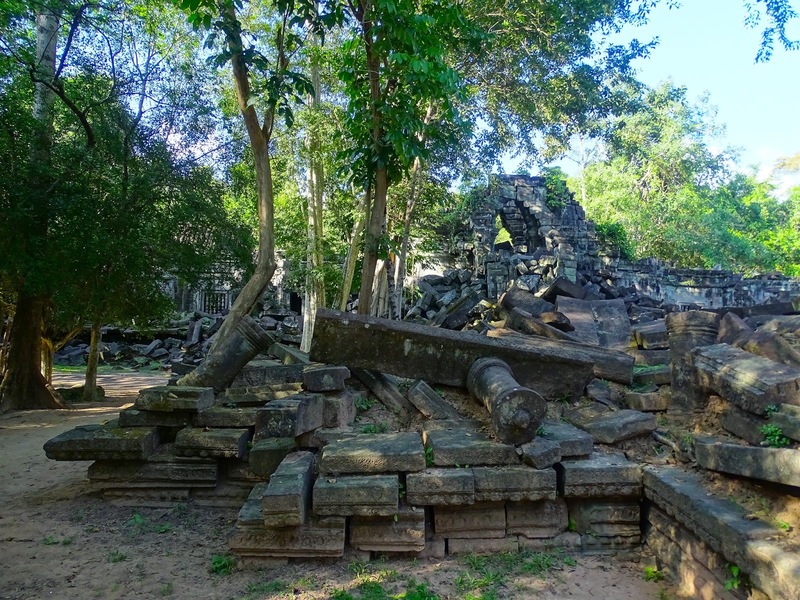 Like Beng Mealea, it was left largely unrestored. Unfortunately for us, we were only able to take a couple of quick photos before the sky opened up and it rained with monsoon-like volume for 30 minutes! We took shelter with some local ladies and kids who were selling souvenirs. They were very kind to invite us under their shelter. Everywhere was wet and muddy after the rain had stopped. My sister didn't want to explore further in the mud so we decided to return to the car. As an indication of just how wet and muddy it was, my sister spotted a 12" Philippine Catfish "crawling" across the muddy avenue that lead to the temple. 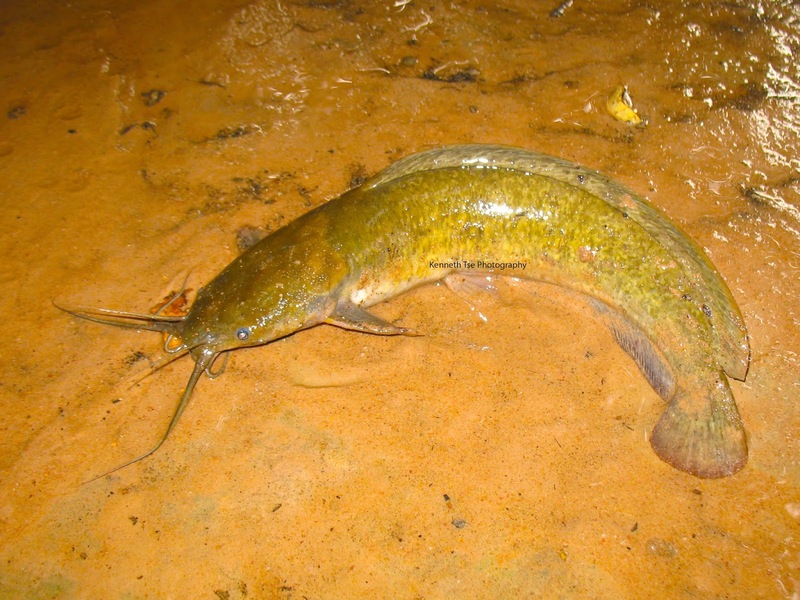 These catfish are also known as Walking Catfish for their ability to crawl over ground from one waterbody to another. The fish was at least 100 metres from the closest water source. I decided to grab it and donated it to Keo, since he already had the Striped Snakehead I caught earlier. On the way to the hotel, we passed by the South Gate of Angkor Thom. 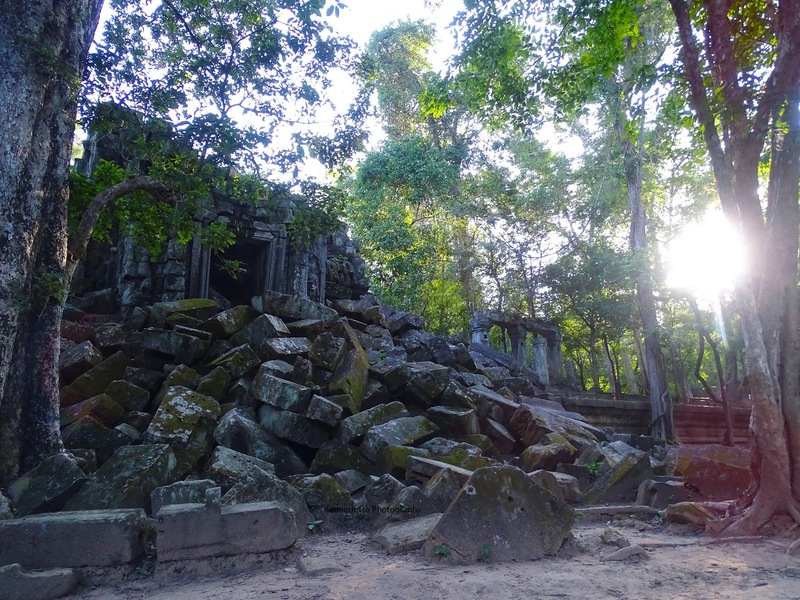 While consulting Keo a few months ago, I was told that fishing was not allowed within the entire Angkor Archeological Park. 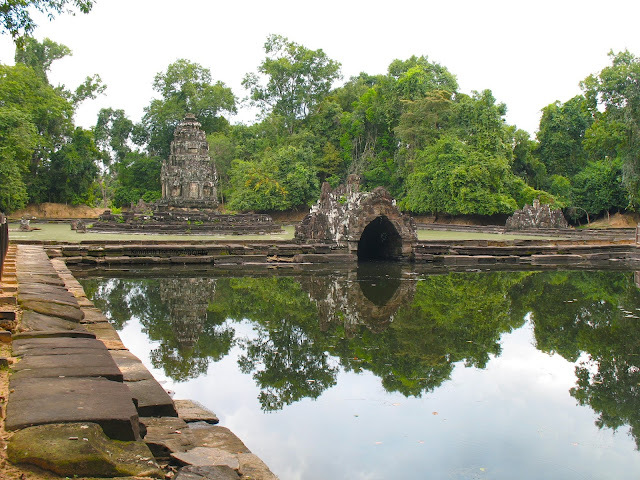 But on this day, Keo said we could actually fish the moat around Angkor Thom. Since our temple tour was cut short by the rain, we had an hour left before dusk. My sister said she had no problem resting in the car while Keo and I tried the moat for a bit. As soon as we arrived, I saw a small Striped Snakehead in the weeds. It came to inspect the small wiggling worm but ultimately decided not to take the chance after looking directly and intently at me. We caught many Malayan Leaffish until I finally caught a new species with the tanago hook. We quickly ran out of day light and Keo delivered us back to the hotel. I'm sure we had dinner that night, but honestly can't remember where we ate and what we had. But we were in bed early as we had a very early start the next morning. 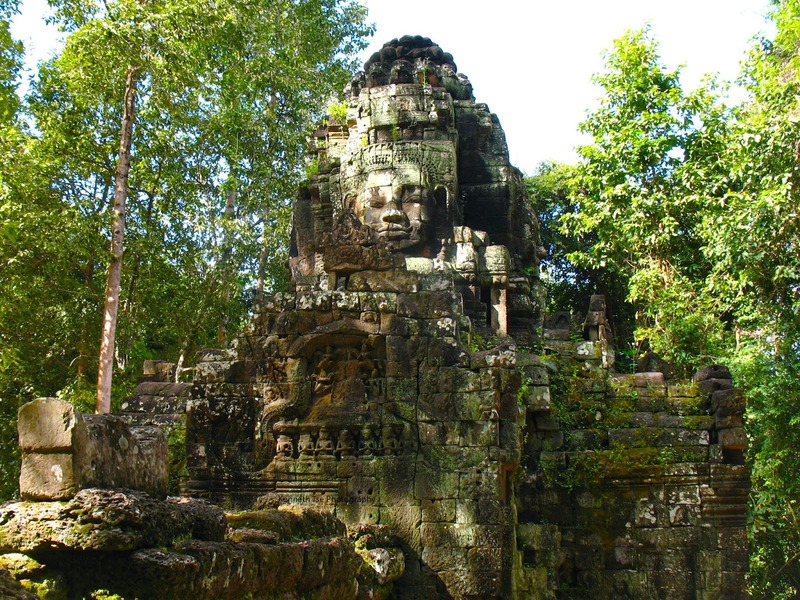 My sister and I landed in Siem Reap airport and our driver, Keo, was already waiting due to a slight flight delay. I chose Keo specifically since he was the only driver, from a dozen that I've spoken to, who knew anything about fishing in the Siem Reap area. While he's not a fishing guide by any stretch of imagination, at least he knows a few fishing spots where we can explore, and names of some local fishes that we can target. The first order of the day was to purchase our Angkor Archaeological Park pass. It was a chaos at the ticket office with several thousand people waiting to take a photo and obtain a printed pass, but it was relatively quick and painless considering the crowds. With out passes in hand, Keo pointed the car south for 45 minutes. Our first stop was Bakong, a 9th century AD temple mountain made of sandstone, that was the first of its kind constructed during the Khmer empire. 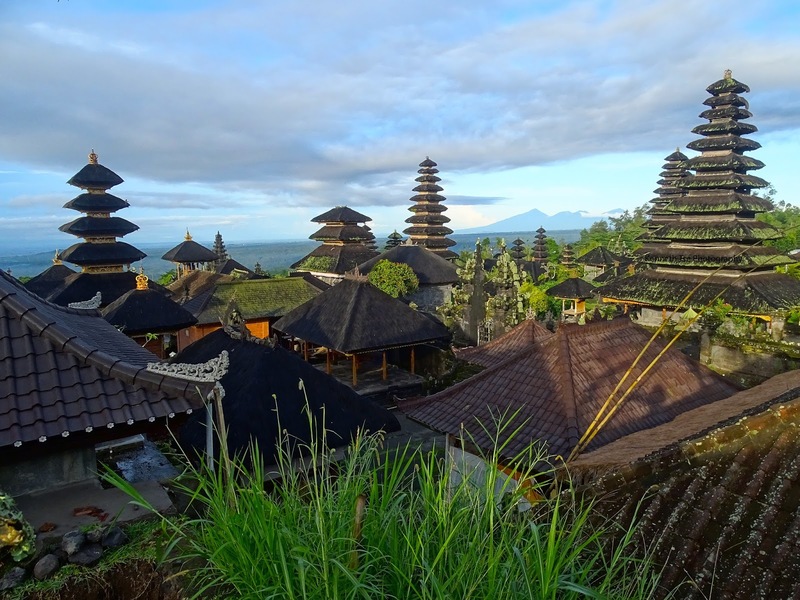 These temple mountains represents Mount Meru, the home of the gods in Hinduism. The temple is a stepped pyramid with strong Indian temple architecture influences. 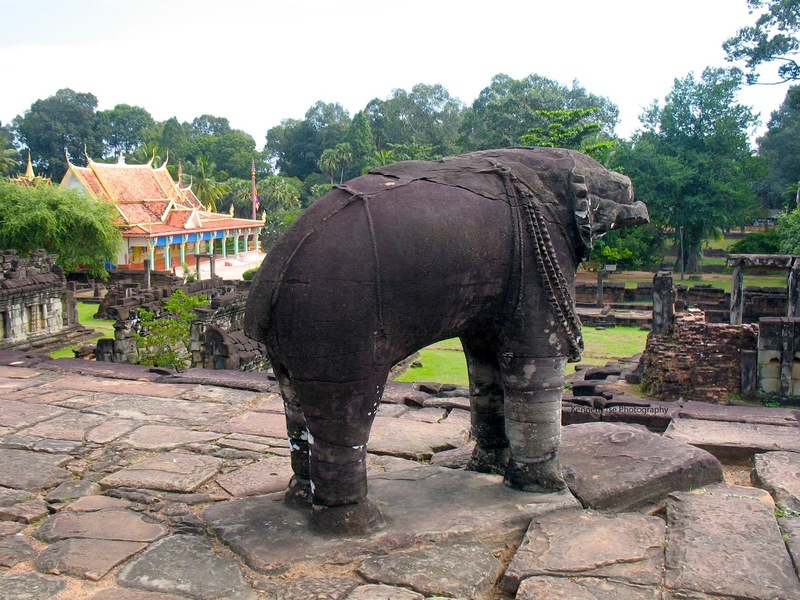 Stone elephants protected the corners of each level. Stone lions flanked the central stairways. A statue that was long lost and only the foot remains. A short distance away, we visited Preah Ko. 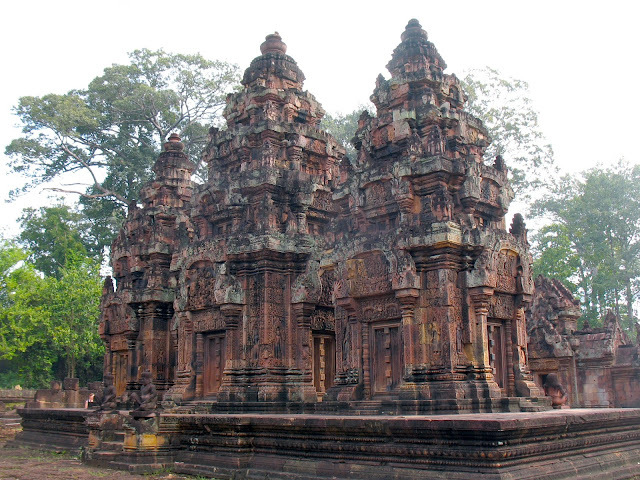 This was the first temple constructed in the ancient Khmer capital Hariharalaya, and this temple predates Bakong. It was a much smaller structure that had two rows of three brick towers. Stone lion guarded the entrance to the tower. 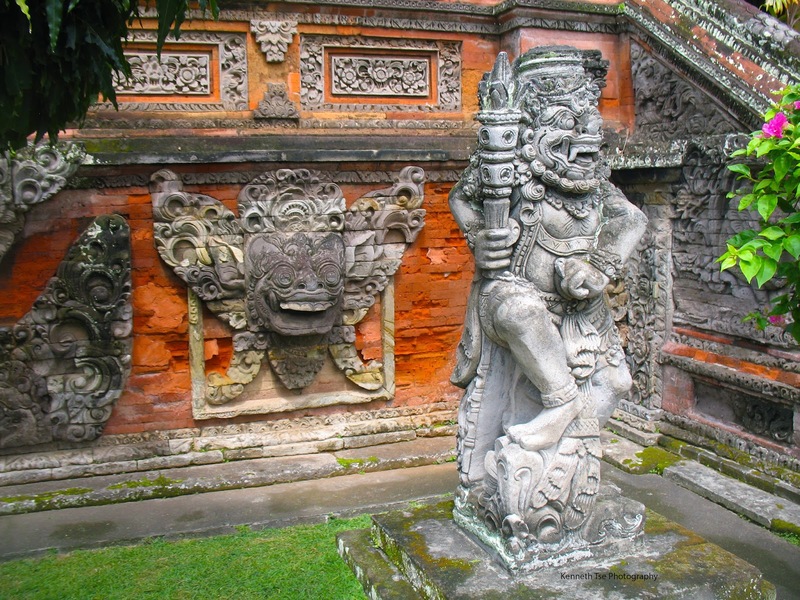 While much of the carving had been lost or stolen, the remaining carving gave an indication how well decorated this temple was in the past. The last temple for this morning was Lolei. Together with Bakong and Preah Ko, these three are known as the Roluos group because they are situated in the modern day town of Roluos. 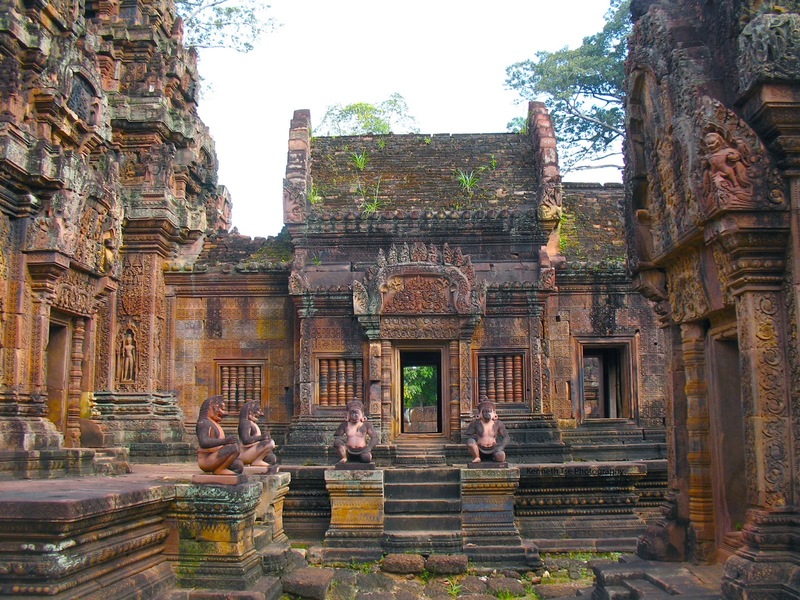 Unfortunately, Lolei was under restoration and the entire complex was concealed by bamboo platforms and canvass sheets. 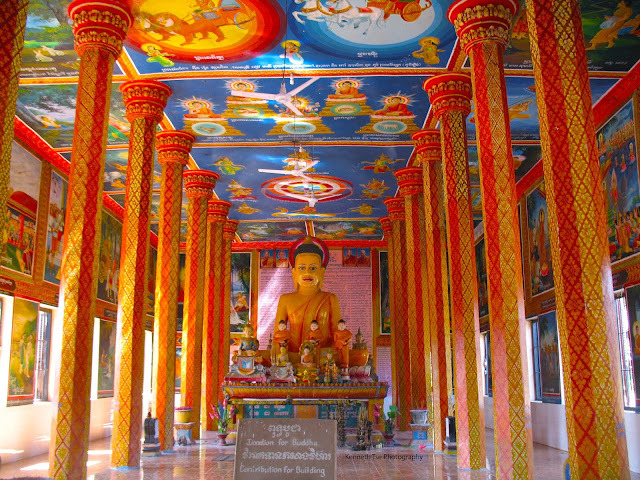 My sister and I stepped into the Buddhist temple, Wat Lolei, beside the ancient run and found an amazing interior! The food was decent, but it was still much too touristy for our liking. We sat a at a table that overlooked the river, and it was a torture watching small Striped Snakehead hunting small fish along the margins. Unfortunately, the restaurant staff said I could not fish on the property. As soon as lunch was finished, Keo and I went to fish another section of the river while my sister took a nap at the hammocks that the restaurant provided. Using worms, it took no time to start landing some fish. 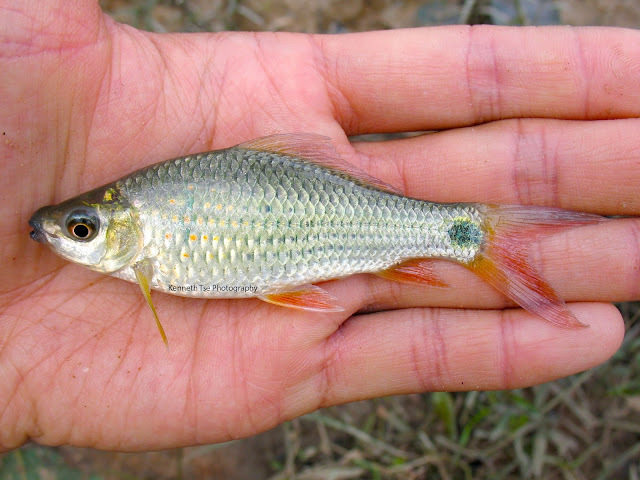 Unfortunately, the most plentiful species was also one that I had caught previously. 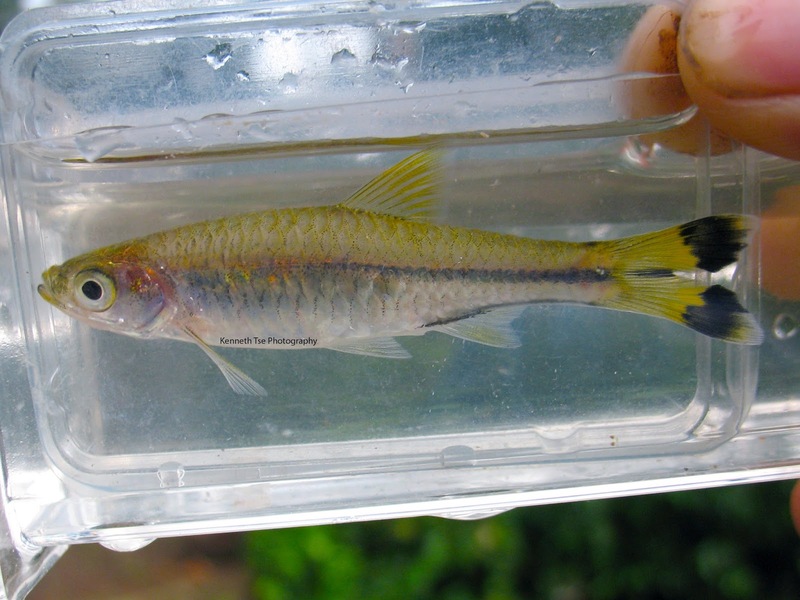 Finally, after catching a dozen of Malayam Leaffish, I was able to find a new species. Occasionally, a Striped Snakehead would surface. However, they didn't want worms. Keo did catch a really cool freshwater Puffer that I could not catch. I started to walk around to look for Striped Snakehead only to find none at our location. 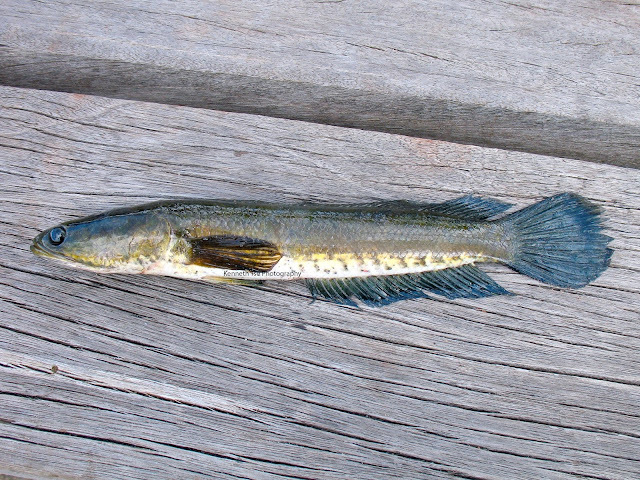 It is important to note that Striped Snakehead can be found very shallow. They are extrememly wary of people and the simple act of walking along the shoreline can cause them to retreat into deeper water or into the vegetation. While looking for Snakehead, I saw a little fish swimming over the tops of the weeds. It eagerly took a flake of worm on the tanago hook and I was surprised to find one of my target species so quickly. The Croaking Gourami looked like it had a bad experience with a Snakehead. We only had an hour to fish and the session was quickly over. Striped Snakehead will have to wait another day. However, the sheer number of them that I saw gave me some confidence that I'll find one soon enough. 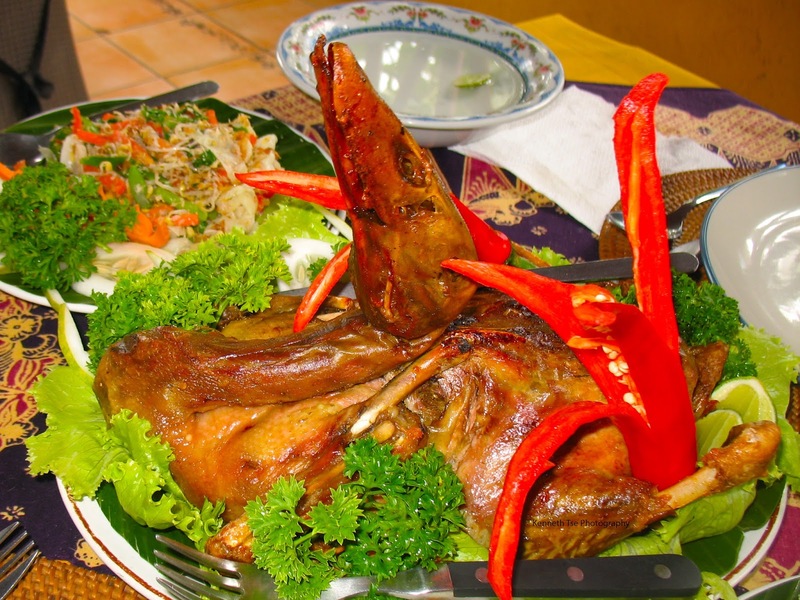 Originally, our itinerary would take us further south to the shore of the massive Tonle Sap Lake, where my sister and I can visit the floating villages and watch sunset on the lake. I also had a couple of hours of fishing included in this plan. However, it was incredible hot and muggy and the sky was quite cloudy, so we decided to change our plans. 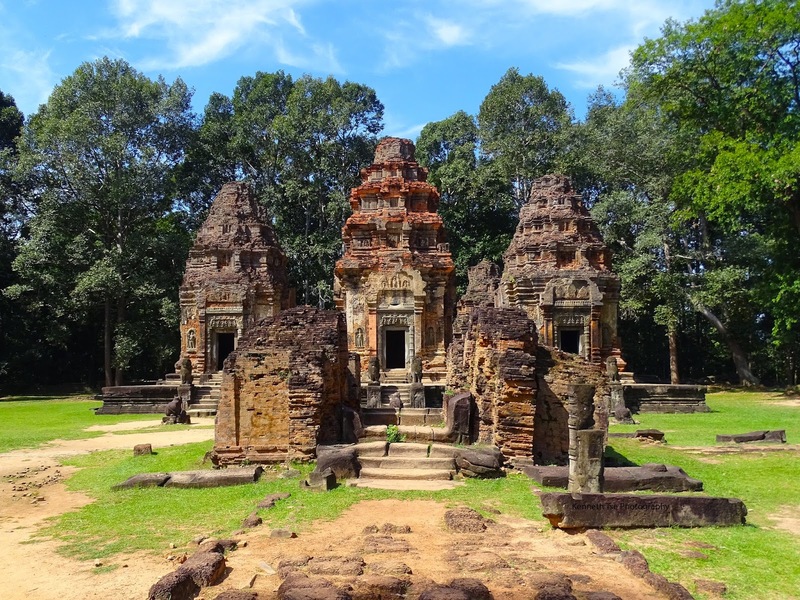 Keo recommended a visit to Beng Mealea, an unrestored Hindu temple built with the same architectural style as Angkor Wat. 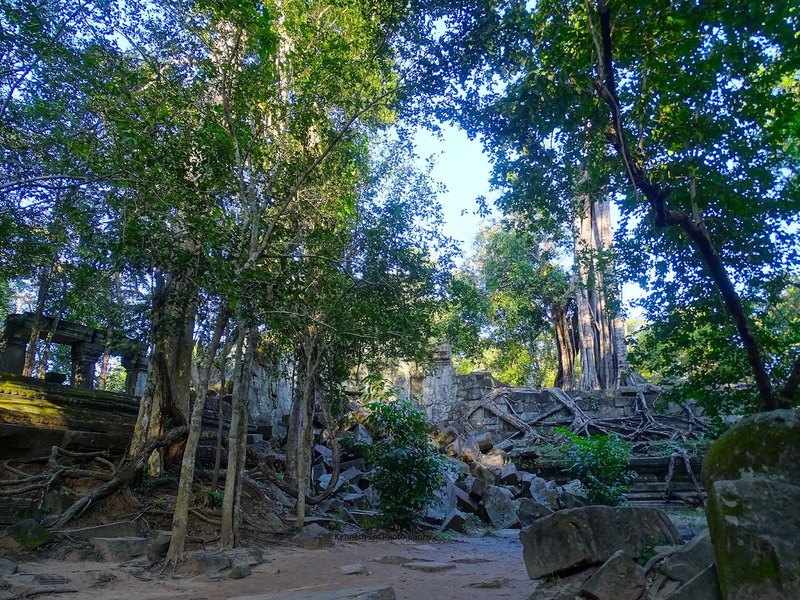 While some of the vegetation has been cleared away, the complex was still deeply gripped by tropical trees. Few of the original structures remain standing. The large amount of collapsed stone block covered by moss created a serene but desolate impression of this complex. We spent almost 2 hours at this complex and soon we were losing light for good photography. On the way back to the hotel, we passed by many street side vendors. We asked Keo to stop at a couple of them. 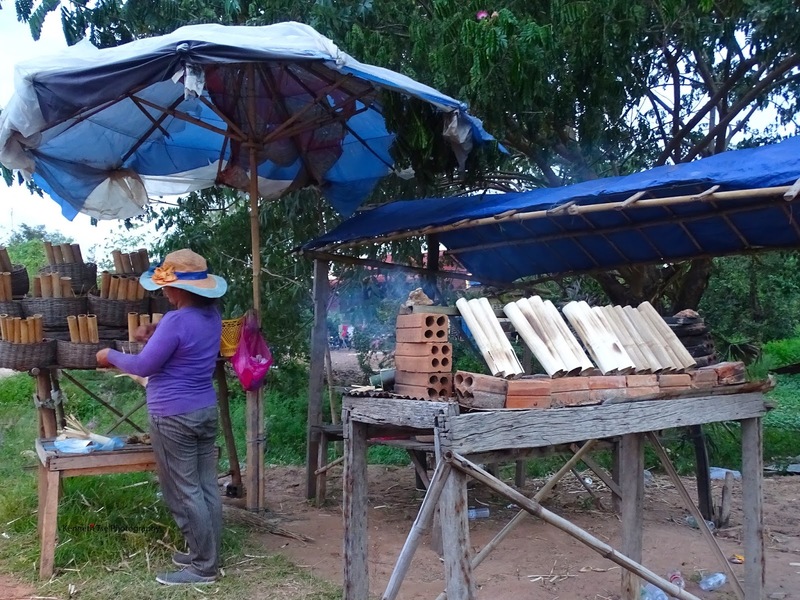 We saw many stalls that sold coconut rice with black soy beans roasted inside bamboo. 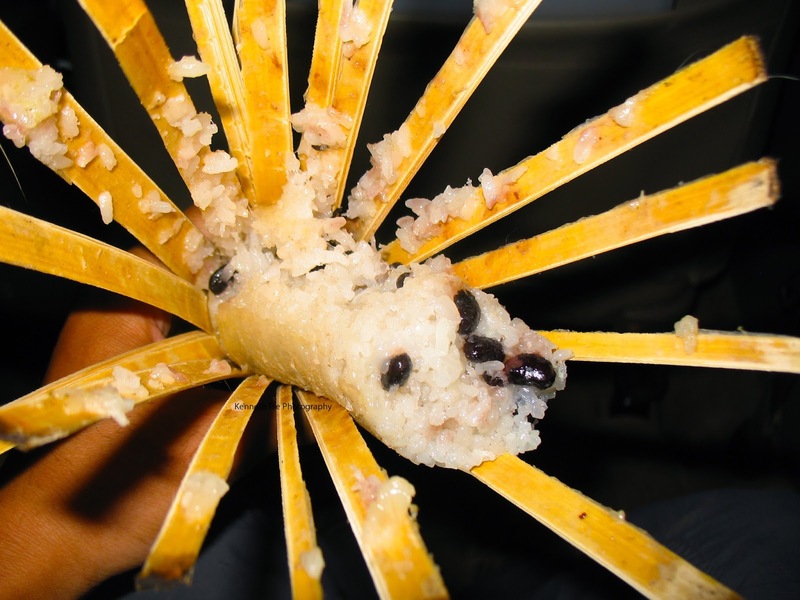 You would pull the bamboo back in strips until the rice is revealed. Delicious! It's slightly sweet and not at all savory. We got 3 for $2 USD. There were also stalls that sold grilled frogs. These can only be found in the country side. 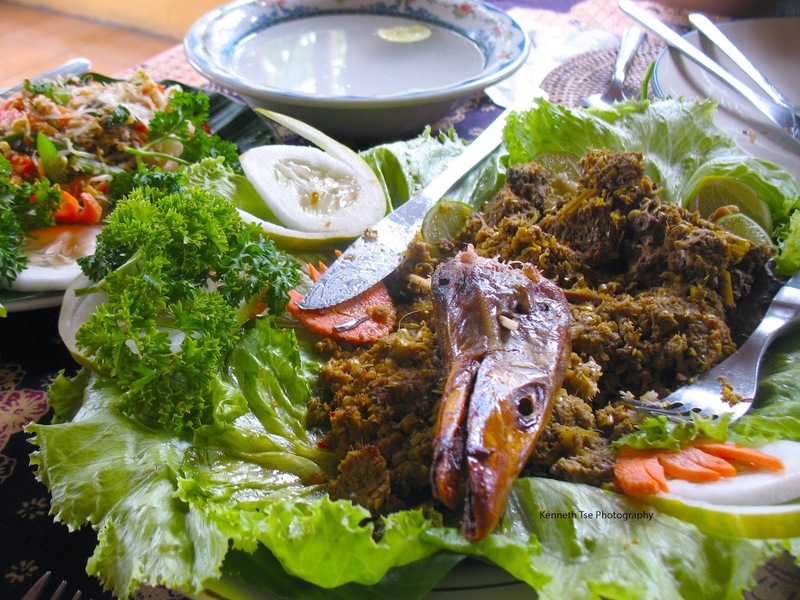 The frogs were cleaned and the abdominal cavity was stuffed with spices including a lot of lemongrass. They were $1 USD for a pair of frogs. Two frogs each were not enough. 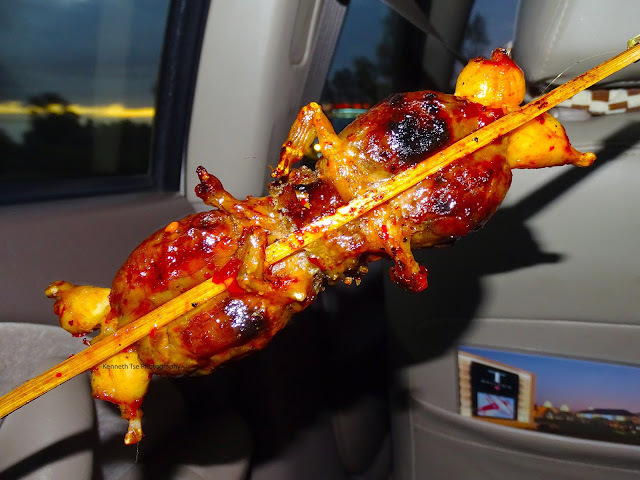 We could have eaten the whole stall worth of frogs! With our stomachs partially filled, my sister and I took a stroll along the main street. 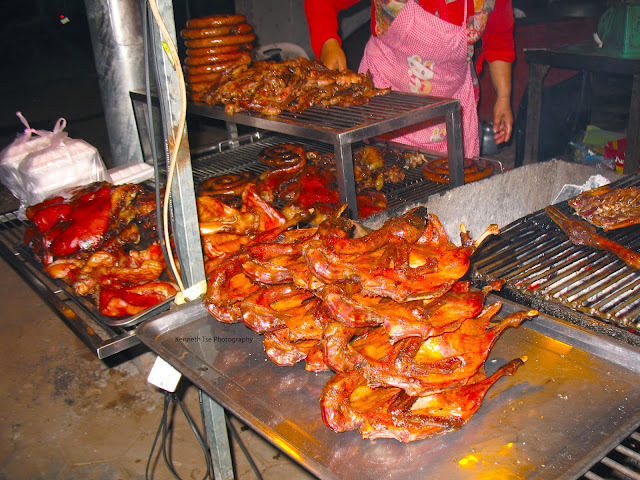 Happily, we found another food stall that sold sausages, pig ears, pig faces, pork jerky and duck. My sister and I love ducks. Our room was phenomenal for $20/night. The internet was so dependent that I actually was able to work on an assignment online. We had another long day tomorrow so we didn't stay up too late. This was our last day on Bali. After getting back to the hotel at 10:30pm, it was hard to get up at 5:30am. However, we wanted to get to Pura Besakih early. I've read that locals pester tourists a lot at Pura Besakih. Some local would ask tourists to pay for a guide fee, only to be asked yet again by another local further along for a guide fee. Other locals would insist that you are required to make donations with money going into their own pocket. There were also a lot of people selling all kinds of good. 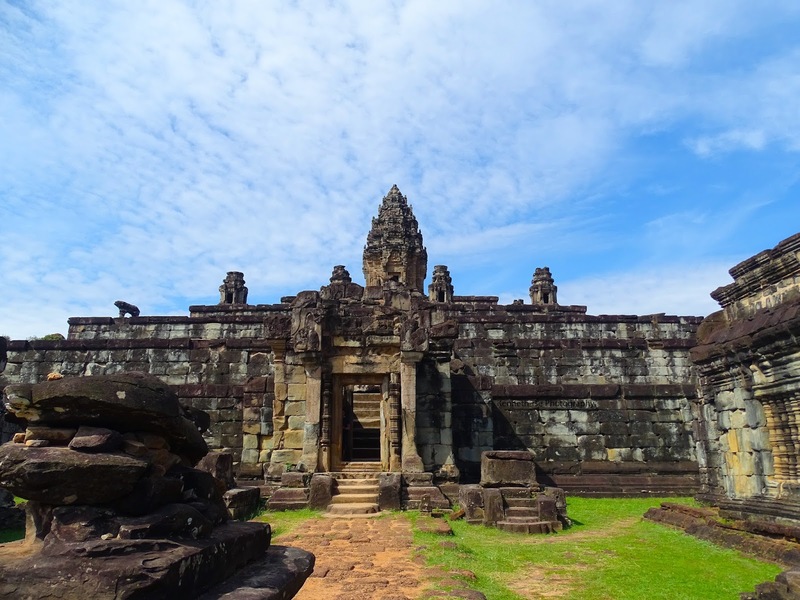 In the past few years, the locals with these poor business practices had made the temple unpopular with many tourists, but large groups of tourists still arrive by buses each day. 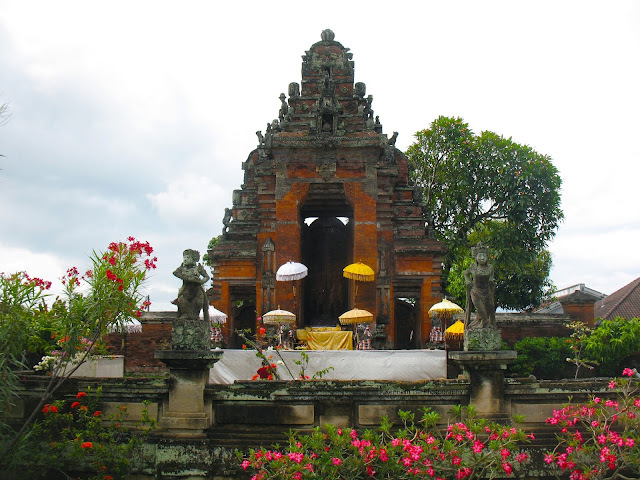 We arrived at Pura Besakih just before 7:30pm. It was so early that the shop that sells entrance tickets wasn't even open. Gusti provided us sarongs and sashes so that we didn't have to rent them, and he taught us how to put them on. The tranquil and peaceful setting was exactly what we had hoped for. It was definitely worth waking up early for it. 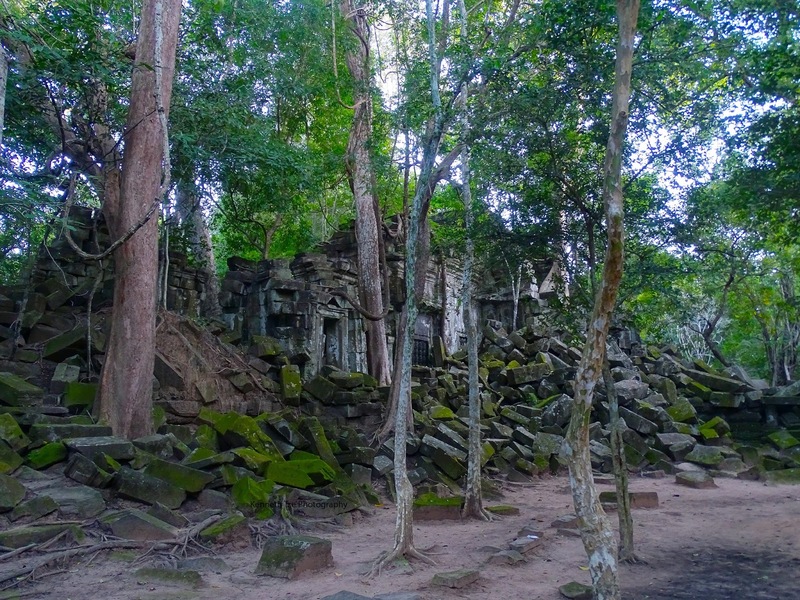 The temple complex was divided into different sections. 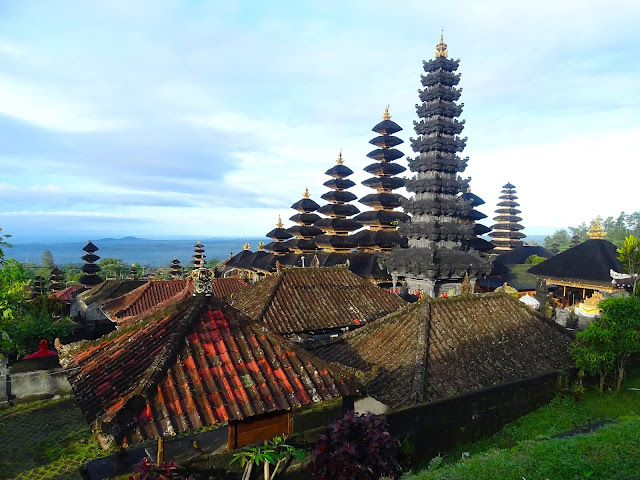 Different class worship and build pagodas in separate areas. 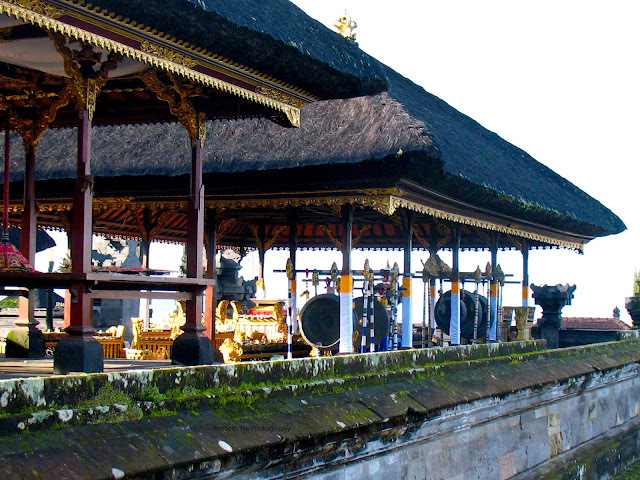 However, Pura Besakih has a main area where all people regardless of class can worship. 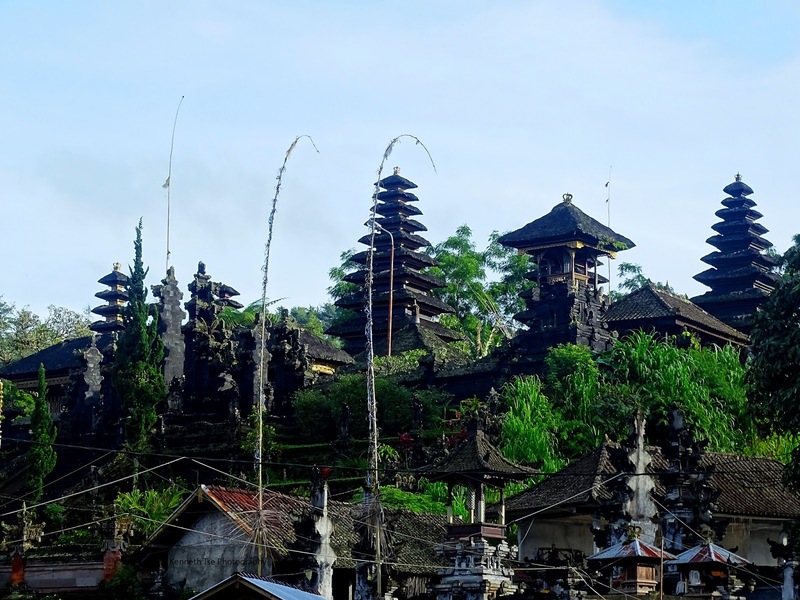 Balinese were celebrating a religious event that occurred once every 50 years. The temple areas were prepared for this event. 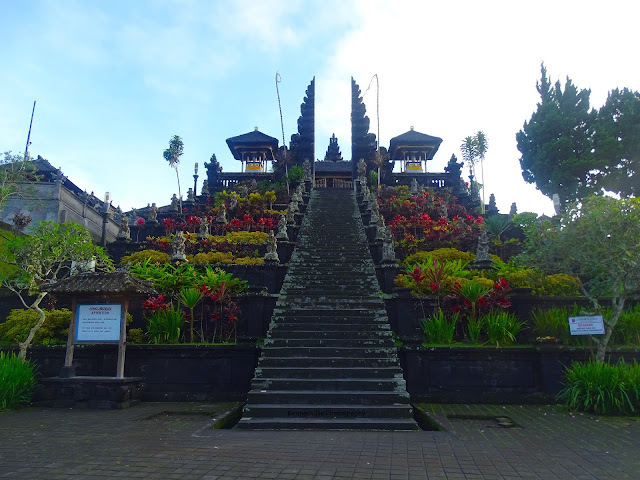 While the temple was quiet during our visit, in another hour these stairs would be full of locals and tourists alike. After an hour at Pura Besakih, we headed north toward Mount Batur. While we were not hiking Mount Batur, we still wanted to see the volcano. It was cloudy with light rain when we arrived. With a little patience, we waited for the clouds to move through and eventually thinned enough for a brief glimpse of the summit. After this picture, the summit was covered again. It was rainy season after all and it was a good decision not to hike the volcano. 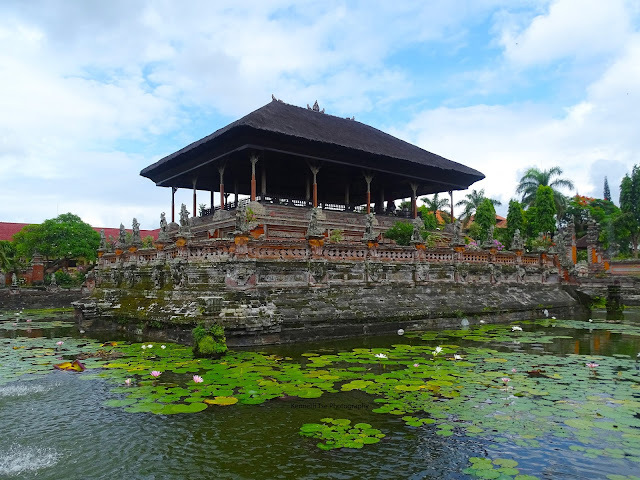 We had time remaining on our tour, so Gusti took us to Taman Kerta Gosa, the Balinese royal court of justice, in Klungkung. Although the ground was idyllic now, Gusti told us that convicts received severe punishments for their crimes such as death sentences for the crime of theft. During the Dutch colonial conquest of Bali, the palace at Klungkung was destroyed. 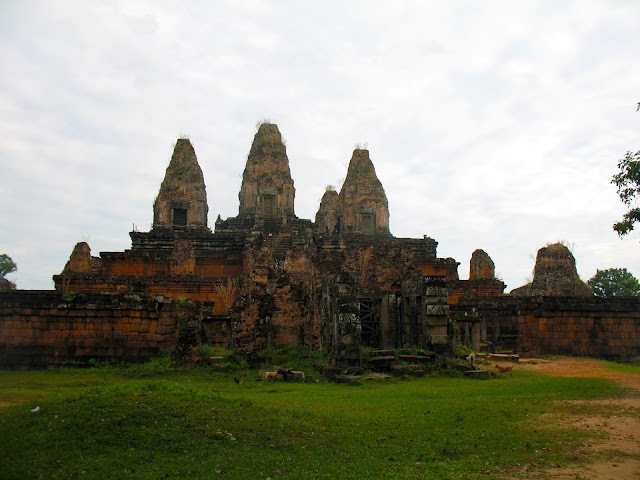 The royal count was part of the palace complex and it was the only part of the palace that was not destroyed. 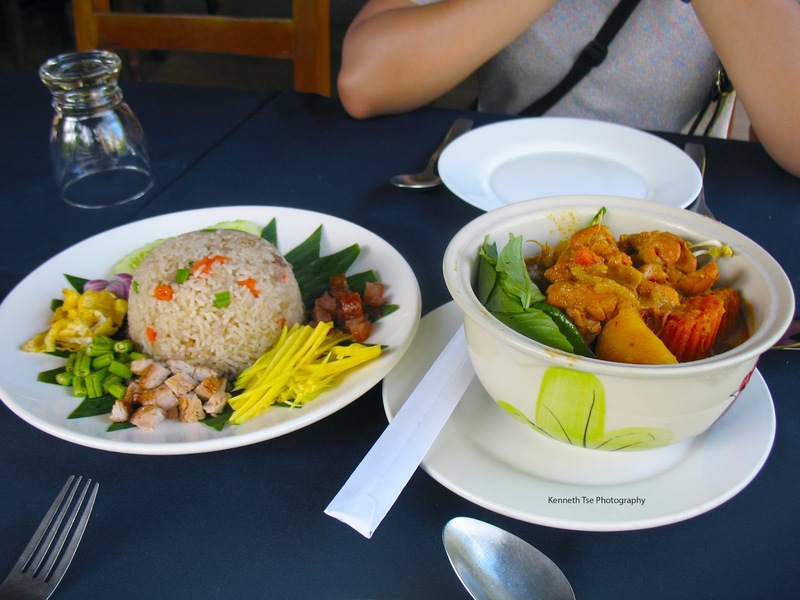 Gusti drove us back to the hotel by 11am just in time for lunch. My sister and I were eagerly waiting for the delicious meal to come. Bebek betutu (bebek = duck) is a traditional ceremonial Balinese dish. In this version of the dish, our duck was stuffed with a spice mix consisted of lemongrass, shallots, garlic, tumeric, ginger, wild ginger, chili peppers, shrimp paste and peanuts. 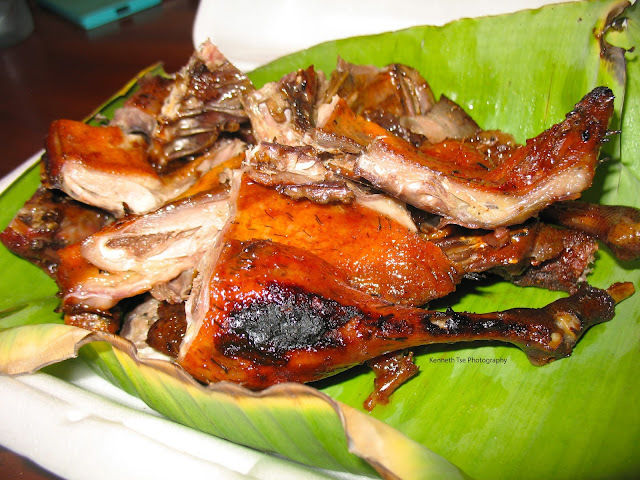 The duck was then slow roasted for hours. Once there was a bebek betutu. It met two hungry travelers. After our meal, we took our time to pack and check out of the hotel. It was another two hours to the airport and my sister and I passed out in the car due to food coma. We caught our flight on time without any issue and arrived in Kuala Lumpur at 8pm. We were still full after the huge lunch meal and didn't even bother to grab a bit before we went to bed.